The two attractions, The Wax Works and Ripley’s Believe It Or Not!, are along the Bay Boulevard, and offer something unique from the normal Oregon coast experience. The two are even connected with a tchotchke type of tourist store with gift items, and an arcade in the same building. It’s easy to visit both, with parking on up the hill behind the second floor. 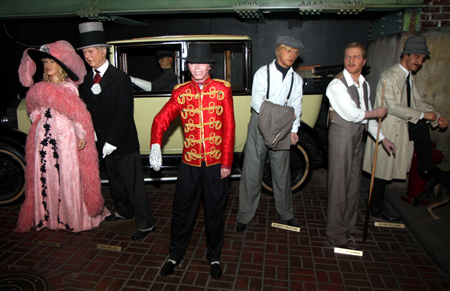 The Wax Works is a walking tour of different full-sized wax figures from movie and rock stars. But if you think the tour will only include movies stars like Humphrey Bogart and Boris Karloff’s Frankenstein and not have more contemporary figures, think again. During the tour you can visit Middle Earth, with all of the stars of the Lord of the Rings movie series, Arnold Schwarzenegger as The Terminator, or hang out with Robert Redford and Paul Newman in their “The Sting” costumes. While you can spend time looking at the amazing details of the wax statues, further along the tour is a working pirate ship, the set of American Idol and even monsters, dragons and Bigfoot. The main attraction of Wax Works is Johnny Depp in his own room and you can get up close and personal – however there is no touching. Taking photos with Depp is the idea, and he is dressed as himself and surrounded with movie posters. The Ripley’s Believe It Or Not! attraction is reminiscent of Wax Works, in that it is a dark walking tour indoors. Ripley’s, however, gives you items to read and listen to: mysterious stories about oddities and how they were discovered is the order of the day. The “museum” is part of a chain that are based on the adventures of Robert Ripley – an adventurer and explorer who lived from 1890 to 1949. After his adventures he would do cartoons that were published in newspapers around the globe, and he was always on the prowl for the unusual and weird. While for adults this attraction is not that scary, for smaller kids, with the dark and weird images, it could cause some nightmares in children under 8 years old. From a card game with corpses, to watching a sarcophagus opening up, there are many different images and wax figures that will keep you interested for anywhere from 30 minutes to an hour, depending on how much you want to read about the different strange items. There are a couple of interactive features, with television screens throughout showing the Ripley’s Believe It Or Not! show with reproductions of the artifacts. If you are looking for some good laughs and a way to get away from traditional coast activities for an hour or more, then a visit to the Wax Works and Ripley’s should be on your list. About Ripley’s and the Wax Works: (From www.marinersquare.com) Ripley’s Believe It or Not features an exciting, and bizarre, array of treasures collected from around the globe. Be part of the world's last great sideshow and take in the oddities that you'll have to see to believe! Where else but The Wax Works can you see Marilyn Monroe and Yoda in the same day? The Wax Works is home to stunningly realistic life-size sculptures and seeings, elaborate in arrangement and with fascinating detail. What to bring: Flash photography is allowed in both attractions, and both are very dark, so make sure you have your batteries charged up. Tip: Parking during busy times in the Historic Bay Front is tricky at best, a long walk from atop the hill at its worst. The two attractions do have a parking lot behind the two-story building up the hill a bit, check to see if there are spots up there before taking too long of a walk. Season: Both are open year round. Getting there: Type 250 SW Bay Boulevard, Newport, Oregon into the GPS and it is pretty easy to find. For those of you who don’t use technology while driving, when you are on the Oregon Coast, take Highway 101 to Newport, then follow the signs to the “Historic Bay Front.” The building housing Wax Works and Ripley’s is near SW Hatfield Drive.